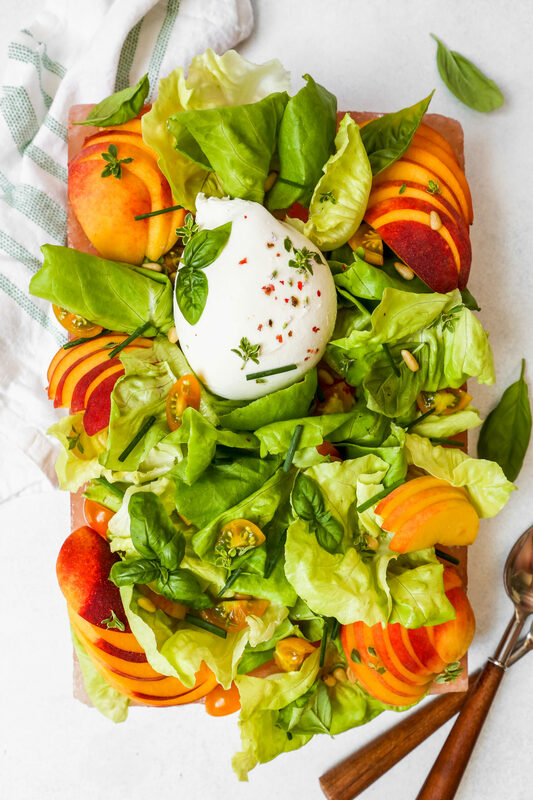 This simple summer salad with peaches, burrata, and a mixture of fresh herbs is perfect for dinner on the patio. 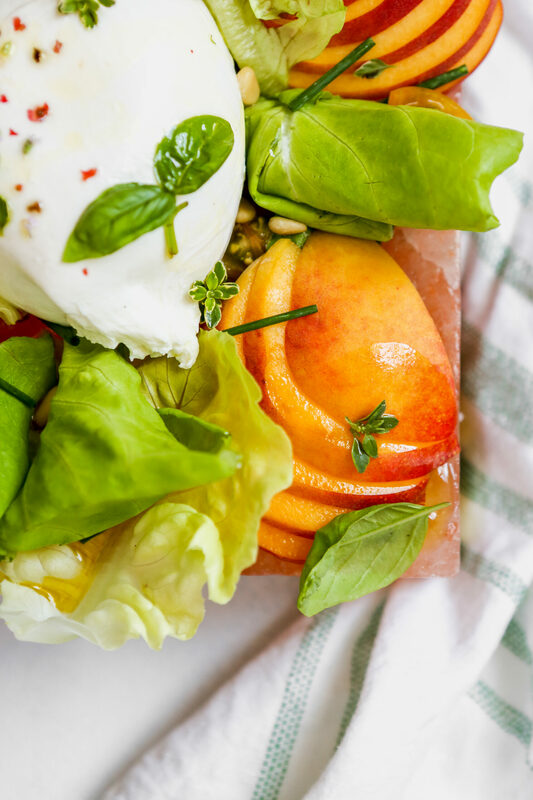 Stunning in presentation, and featuring some ingredients that are often overlooked, this leafy green salad is bound to be a hit. This week we’re at the annual Grant Family Vacation up at “The Lake.” And it’s really the first time G and I have had a moment to slow down, enjoy a good book (or three in G’s case), and get our minds off of work. It’s exactly what we’ve been needing. Like summer usually does, these last few months have flown by. With a few trips under our belt and more weddings than we can count, it’s been a fun summer. But most fun of all was our trip to New York City where G got down on one knee and continued to surprise me for the next 12 hours. It was the most amazing day one could ever imagine, my feet are still searching for the ground. Although I mostly share recipes and food-related content here, I was thinking about sharing some photos and tid-bits about the day. But I want to know, would you be interested? Anyway, this simple summer salad is the kind of meal I like to enjoy at the lake. Light, fresh, and incredibly flavorful. 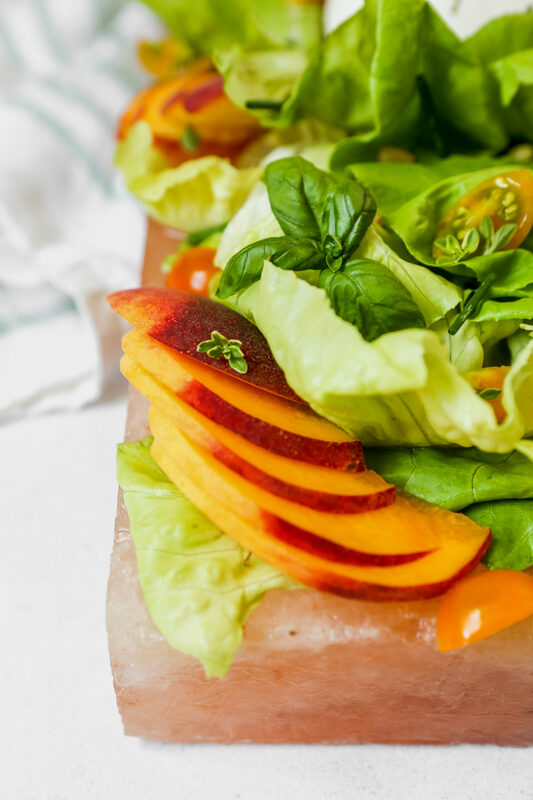 It can look a little fancy on a gorgeous platter, or on a salt block like it is here, but we won’t be styling it while at the lake. Partially because we’re sparse on utensils and serving plates, but mostly because, well, we’re at the lake. 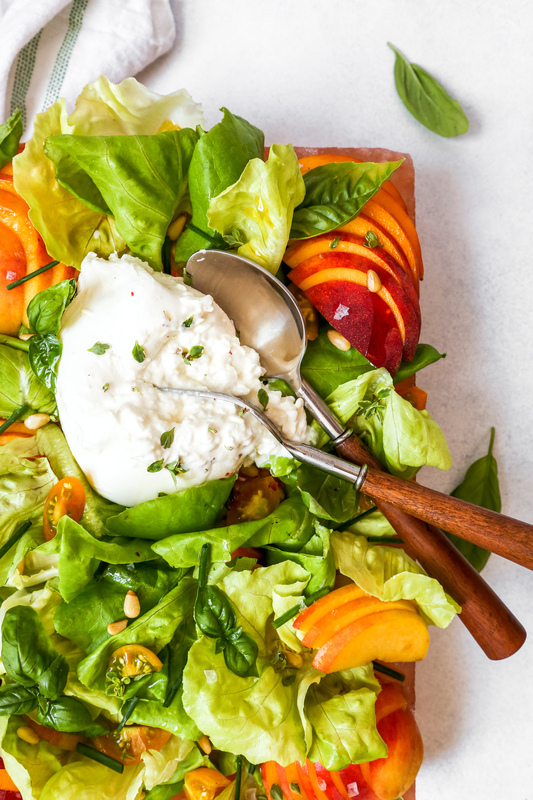 Instead, I’ll toss all of the salad ingredients together, divvy up between bowls, and cut the burrata into pieces for each serving. A little less stunning in presentation, but effective nonetheless. 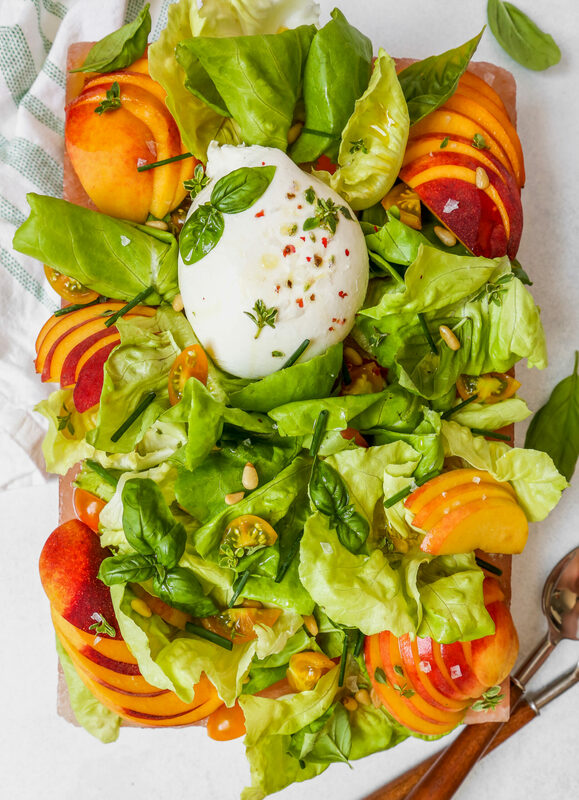 Tender butter lettuce makes a great foundation for a trifecta of herbs (basil, chives, and lemon thyme), ripe summer peaches and tomatoes, and burrata. 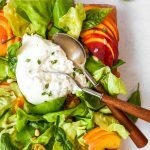 Drizzled with an incredibly easy-to-make vinaigrette, this beautiful and satisfying salad comes together quickly and easily. Whisk together oil, vinegar, lemon juice, honey, and pink peppercorns for the vinaigrette; season with salt and black pepper. Toss lettuce, basil, chives, and lemon thyme together; transfer to a platter. 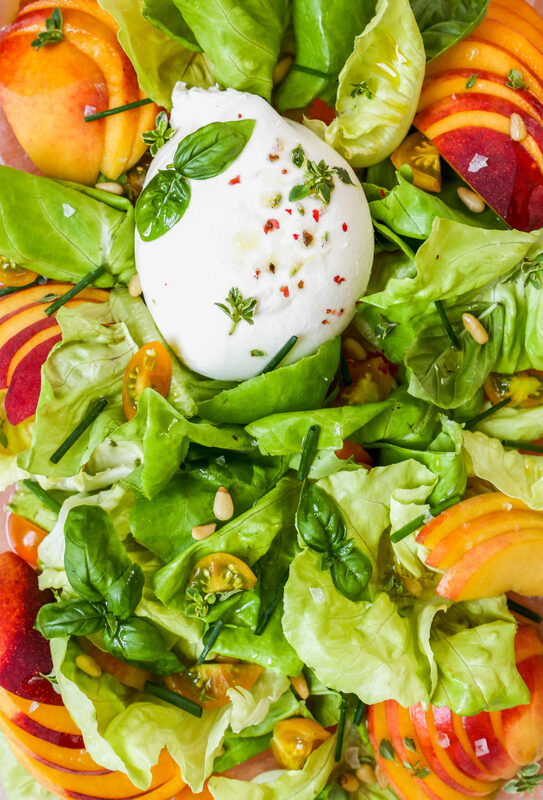 Arrange peaches, tomatoes, and buratta over salad. 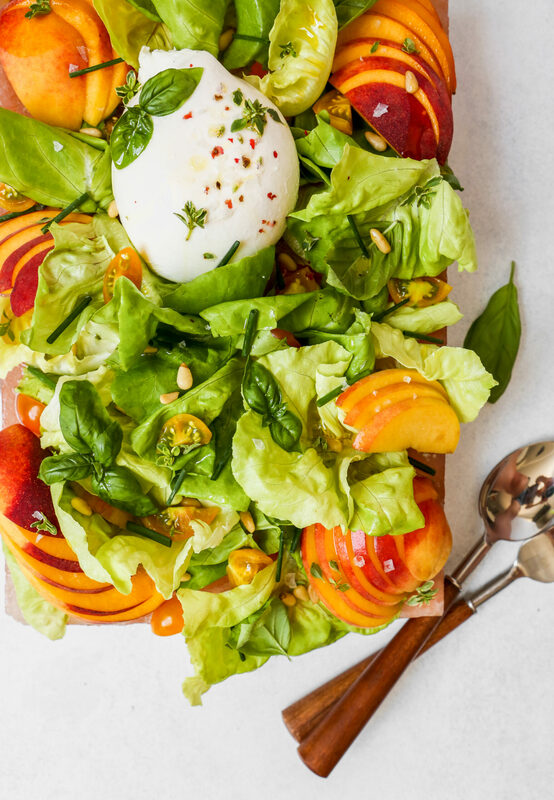 Sprinkle with pine nuts, drizzle with vinaigrette, and serve. 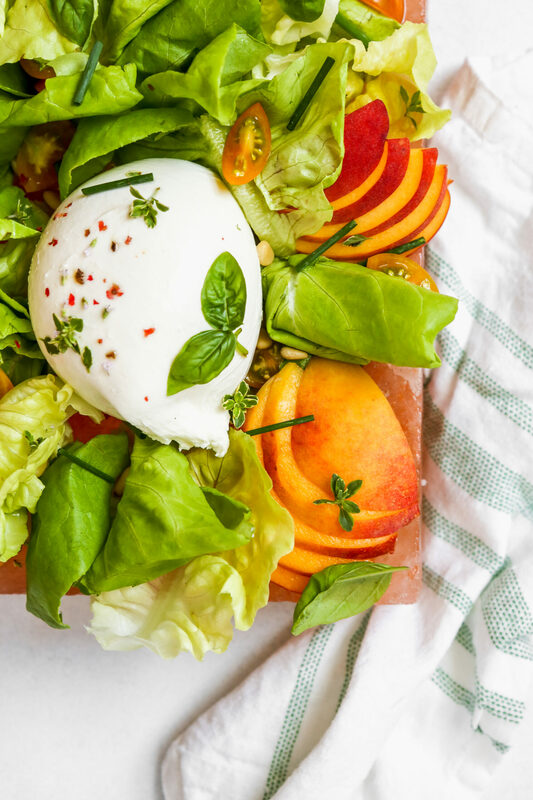 You can find burrata in the specialty cheese section of your local grocery store and is often packaged in a brine solution in clear plastic tubs. I would love to hear more about the day you and G got engaged! LET’S HEAR THE Deets! Yay! Thanks for being interested!